total flexibility: one feet adjustable to approx. 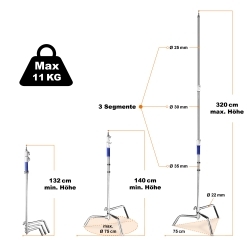 120cm height, therewith ideal for the use on stairs, on walls, etc. max. load capacity: approx. 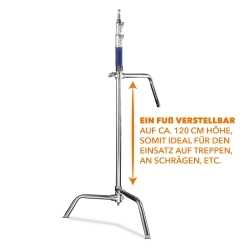 11kg! Did you know this: The so called C-Stands (as abbreviation from Century Stand) were used at the earliest days of filmmaking as to catch the light of the sun with reflectors. 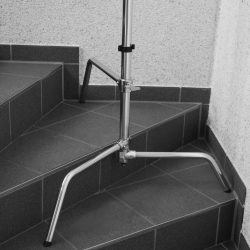 This very day, this early version of a tripod is still very popular for video shootings, in photography and other areas. 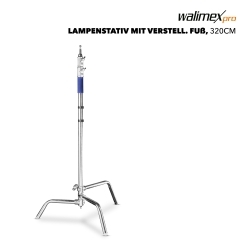 Our walimex pro C-Stand Lamp Tripod combines innovation and individuality. 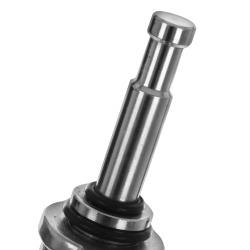 The high-quality materials even resist the toughest strains and roughest weather conditions, so that they provide a secure and reliable use. The Lamp Tripod is characterized through its intelligent C-form feets. This is a feature, which makes the Tripod stable and secure, and at the same time very flexible. Because one feet can be adjusted, the Tripod can adapt to every occasion. 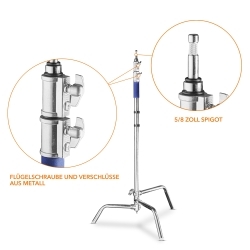 You can position the Lamp Tripod on e.g. stairs or on uneven surfaces during your outdoor shooting. An even position as well as secure stability is always given. 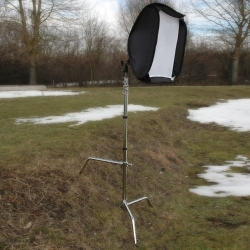 The walimex pro Lamp Tripod is furthermore equipped with two cable clips and one 5/8 inch spigot. Therewith you are perfectly equipped for your next photo adventures.